I believe some investors are still in the state of numbness, while many others still believe that Hyflux is different from Noble as Hyflux hold hard assets with strategic relevance to Singapore. Many others may not even know their investments are in trouble, especially those retirees. How am i affected?I don't know frankly because i am still sleeping fairly well, but i am posting pretty fervently and finding out more. Its weird. I don't understand myself...maybe it hasn't sunk in. I don't know. But i certainly hate to lose money. Anyway, is this a cashflow problem for Hyflux that is temporary and just needs time to heal or a structural one where Hyflux should just be allowed to fail. Let's not look at the assets Hyflux hold as a national strategic one, but rather through economic lens. Hyflux problem started with the Tuaspring desalination project. I really hate to say this, but the following keeps glaring at me when i read about the projects Hyflux does. "Tuaspring Integrated Water & Power Project is Singapore’s first"
".....largest desalination plant in South East Asia.."
"TuasOne Waste-to-Energy Plant is Singapore’s sixth and largest waste-to-energy plant"
It feels like Hyflux loves to bite off more than it chew to please "i don't know who" to want to keep having buzzwords like "largest", "first" in their projects. Hyflux is like in a start-up mode, taking projects which are unchartered and that they have not much experience. Hyflux ventured into the electricity business by way of the integrated power plant linked to the Tuaspring Desalination. For me, i think Hyflux should just stop taking on such adventurous projects before amassing a large cash hoard. They should instead just continue to do what has been tried and tested and earn recurring revenue from maintenance. From what i see in the investor announcement, the earliest i managed to search regarding Tuaspring is in 2011. See here. I would believe the feasibility studies done to decide to built Tuaspring would have been done much earlier than 2011. But i will just show the average USEP prices from 2011 to 2018. Data is taken from EMA. Read this first to understand why the USEP prices decreased. It was during the period 2011 - 2013 where Hyflux secured funding for Tuaspring. In 2011 ,DBS, Mizuhi and Sumitomo Mitsui who together loaned $150 million. And in 2013, Maybank loaned Hyflux $720 million. 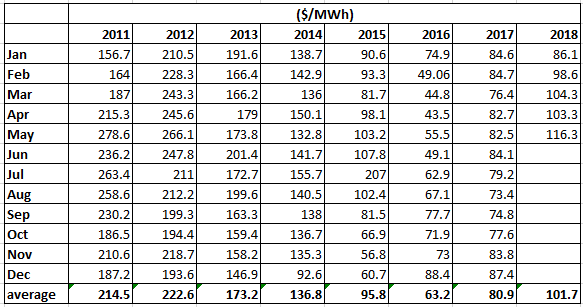 The average annual USEP prices from 2011 to 2013 was in the range of $214.5 to $173.2, making $173.2 the base at which i guess Maybank deemed Hyflux profitable enough to dare to loan such a large amount with i think, a safety of margin. Look at the average annual USEP price after 2012! It was the lowest in 2016 and 2017! Compare the USEP price to the 5 year income statement of Hyflux. Hyflux, without the Tuaspring electrical component would have been an ok company. Without the Tuaspring, Hyflux would have been a profitable company, though in 2017, why it suffered a loss of $34 million attributed to other businesses needs to be investigated. So whether Hyflux can pay back the debts or even survive would really depend on the USEP prices in the future. From simple linear interpolation, it would seem a USEP price of $127 would be the breakeven price for Tuaspring.